This is arguably everything I like in a single, palm-sized package. Bourbon? Check. Chocolate? Check. Cured meat? Check. Ooey gooey cookie? Check. So much win, guys. I just had a couple of these little babies for brunch and the gourmand in me is happy. I’ve been inspired to make a bacon dessert for a little bit now, and finally I found it within myself to buy some bacon – and my creative juices were going into overdrive. 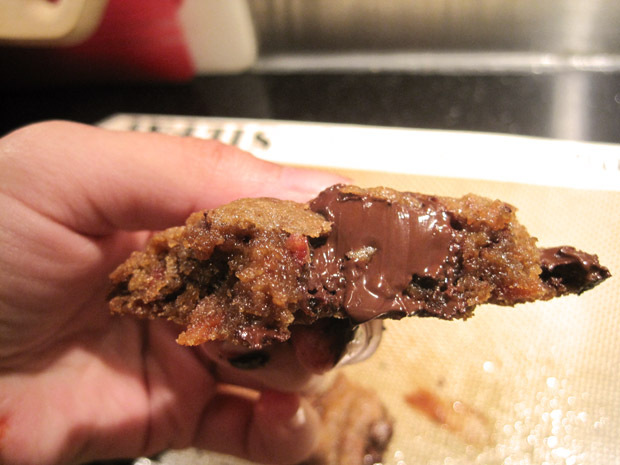 I finally settled on a bacon dessert in cookie form, and I created this cookie. 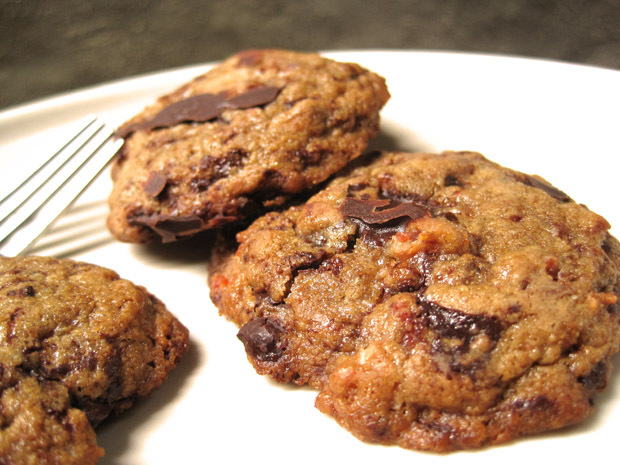 This cookie uses a Cook’s Illustrated recipe as its base, and I tweaked it a little bit based on the various variations of bacon chocolate chip cookie recipes that I researched. 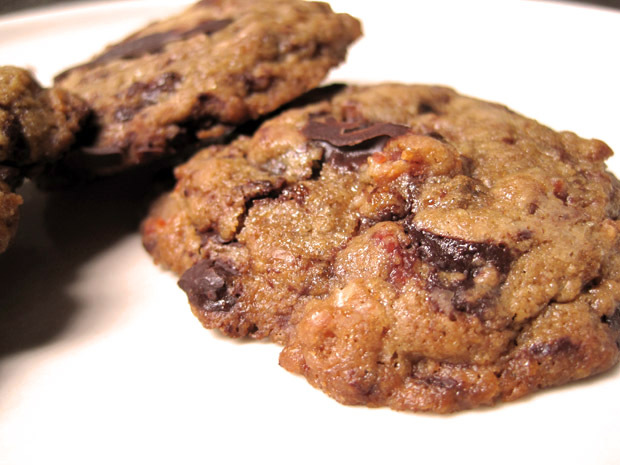 I replaced some of the butter with rendered bacon fat (mmm bacon fat in cookies), reduced the vanilla essence, reduced the chocolate chips, added crispy bacon bits and added a couple tablespoons of bourbon. Texture-wise, I found it a little cloying right out of the oven – I think the presence of lard was particularly noticeable when the cookie was warm. However, the cookie was quite delectable after having set in the freezer overnight and returned to room temperature. If I were to do this again, however, I’d probably use a tablespoon less bacon fat, and maybe 3/4 cup of chocolate instead of 1 cup. It’s a really powerful punch of sugar and fat – even I think so – and I think it needs to be toned down just a wee bit. 2. Heat 10 tablespoons butter in 10-inch skillet over medium-high heat until melted, about 2 minutes. Continue cooking, swirling pan constantly until butter is dark golden brown and has nutty aroma, 1 to 3 minutes. Remove skillet from heat and, using heatproof spatula, transfer browned butter to large heatproof bowl. Stir rendered bacon fat into hot butter until completely melted. 3. Add both sugars, salt, and vanilla to bowl with butter and whisk until fully incorporated. Add egg and yolk and whisk until mixture is smooth with no sugar lumps remaining, about 30 seconds. Let mixture stand 3 minutes, then whisk for 30 seconds. Repeat process of resting and whisking 2 more times until mixture is thick, smooth, and shiny. Using rubber spatula or wooden spoon, stir in flour mixture until just combined, about 1 minute. Stir in chocolate chips and bacon bits, giving dough final stir to ensure no flour pockets remain.